It is quite cold outside these days. I hear my piano man coughing often. He has been sick for a few days with cold. Life is busy with lots things happening everyday and I felt bad that I didn’t pay him much attention when he got sick. For being a such a good wife (?) I decide to make him some good soup from scratch. 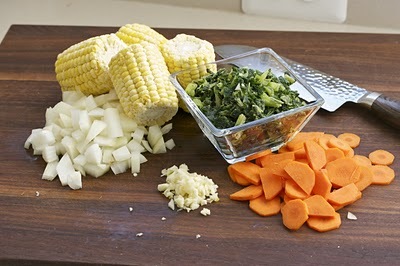 When you think of making a soup for your loved ones, what ingredients comes to your mind first? 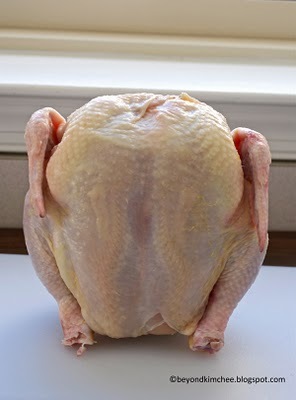 I am so happy to see the headless chicken. Making chicken soup from scratch is not difficult but takes some time. 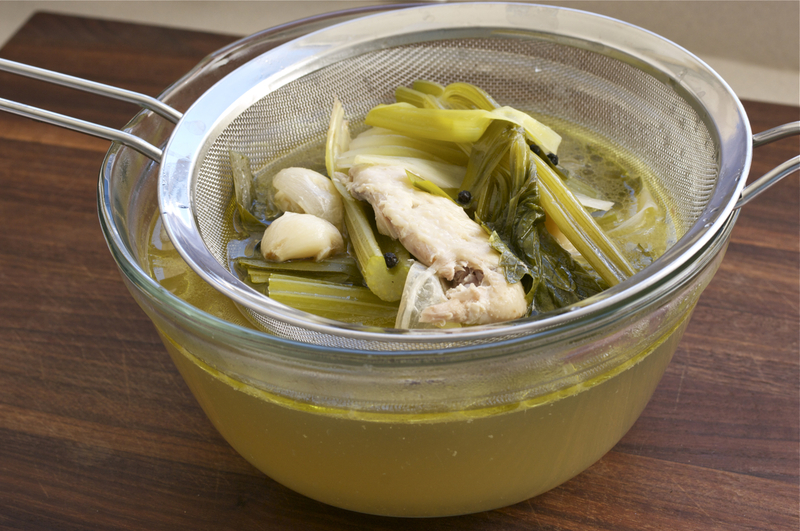 So make the chicken stock ahead of time. You can put the soup together 30 minutes before serving. 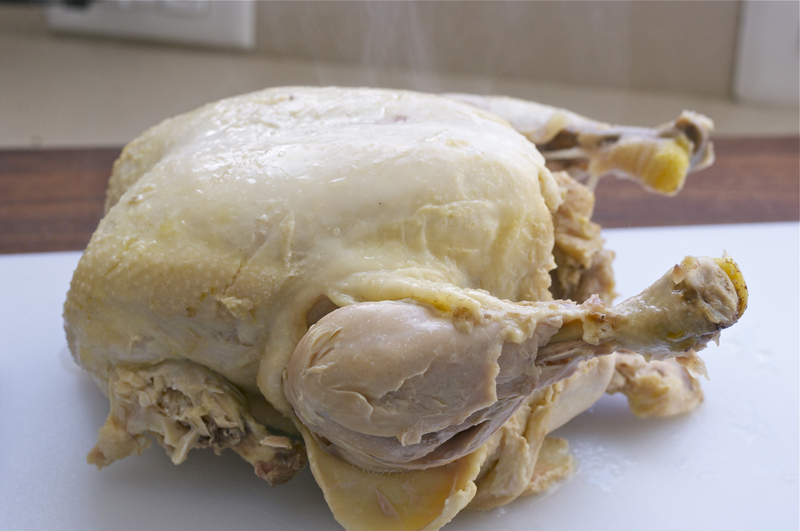 Clean your chicken inside out first. Let him bath in a big pot of water with other ingredients. Boil and simmer for 1-1 1/2 hour. you will see his legs are nearly falling off. Take him out and let him cool off. Drain the stock, reserving the liquid. Discard all the other stuff. You will see a layer of fat floating on top. I don’t think you want that. Shred your chicken into bite size. I keep them in the fridge until ready to use. After a few hours later the fat layer has been hardened in the fridge. It scoops off easily with a spoon. Here is the beautiful homemade chicken stock. 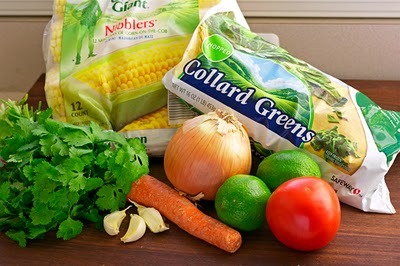 These are what I used to make the soup. and of course, the chicken pieces. Slice, dice, chop the vegetables. In a pot with a little bit of olive oil over medium heat, saute onion, garlic, and carrot for 2 minutes. 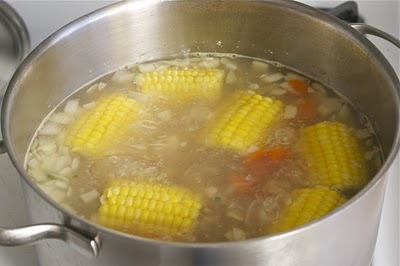 Add stock and let them boil and reduce the heat to medium-low. and collard green to the pot. Simmer until all the vegetables are tender to taste, about 10-15 minutes. Add some salt and pepper (Remember the stock had no salt in it). You soup is almost ready to eat. But at this stage, it is tad boring without any spice. So I like to add my personal touch. I like to add fresh toppings on my soup. cut some limes, and green chili or whatever chili you have. I put them in a serving platter so people can add what they like. 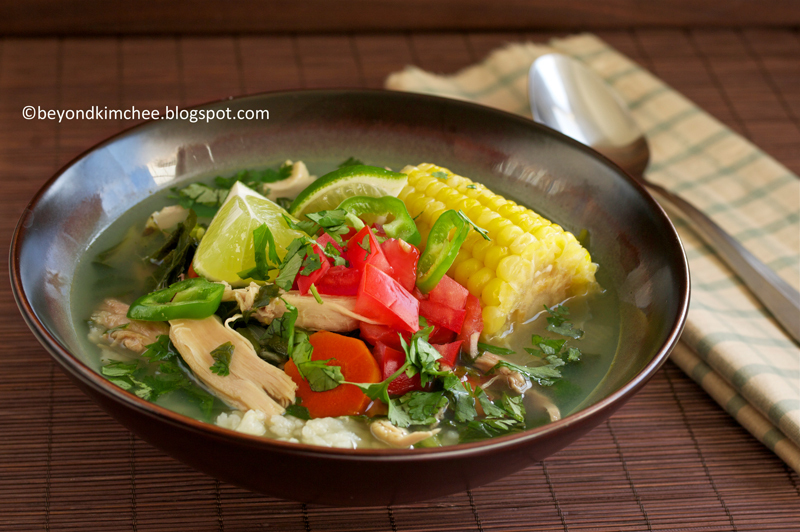 You can add fresh avocado, chili flakes, green onions, etc on the soup. 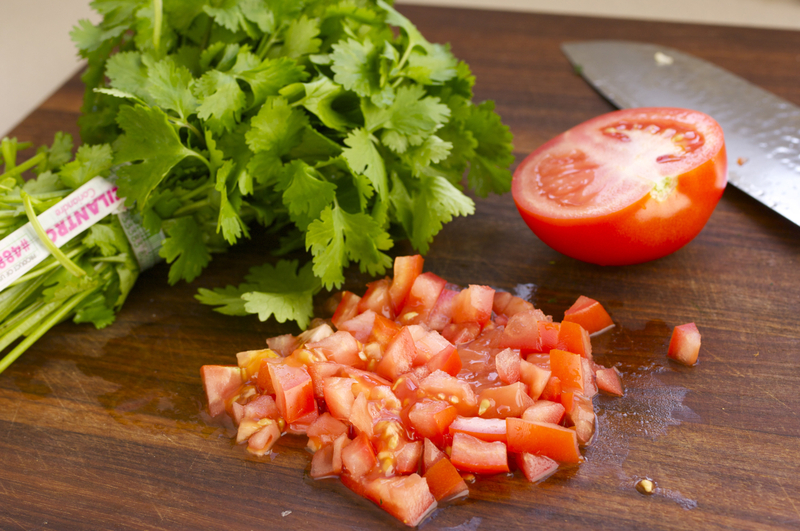 Spice up with some cumin or nutmeg, or fresh herbs if you wish. 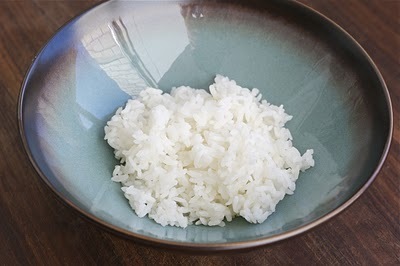 I serve on top of hot rice, just a little bit. 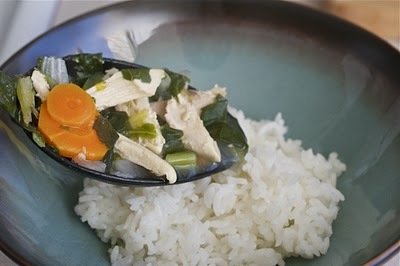 Pour the soup over rice. 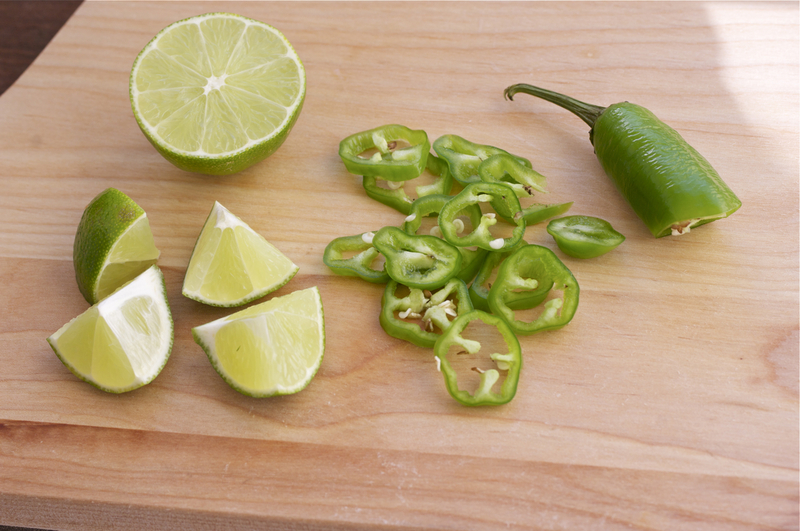 Garnish with whatever topping you like. This is hearty and 100% home-made. Just what your body needs. 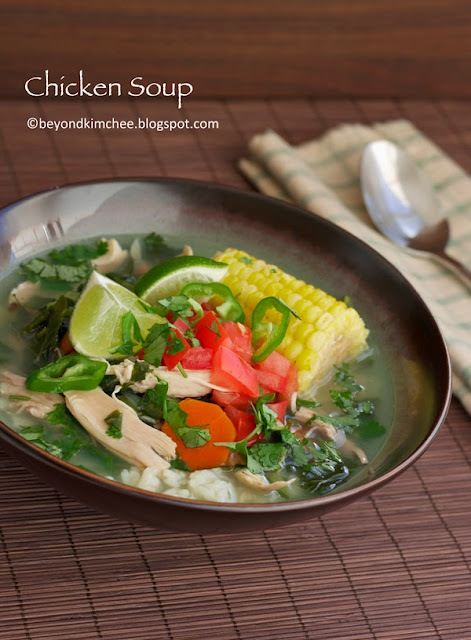 Need a chicken soup for your soul? 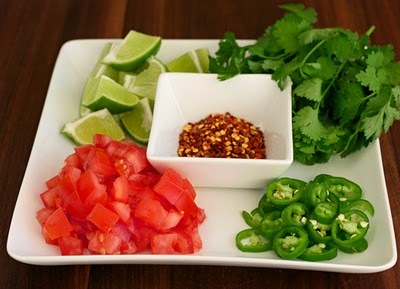 Tomato, cilantro, green or red chili, chili flakes, lime, green onion, avocado, cumin, nutmeg, parsley, dill, oregano, etc. 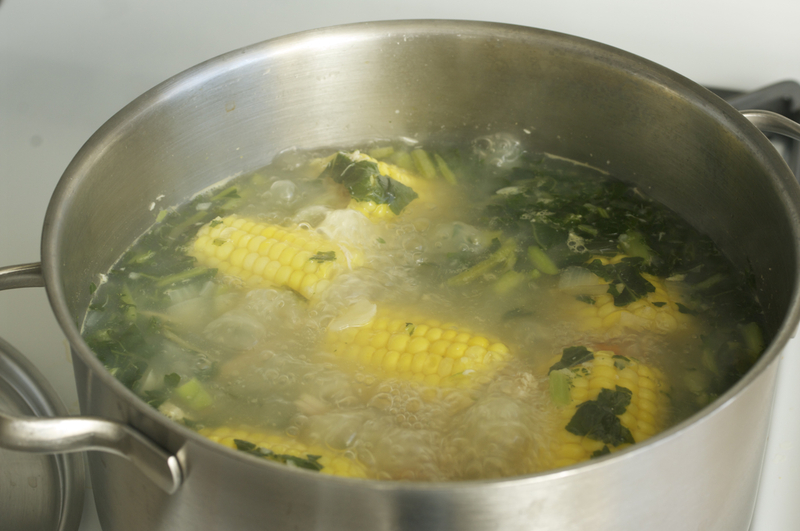 To make stock, combine all ingredients in a big pot over high heat. Add water, cover the lid, and let it boil. 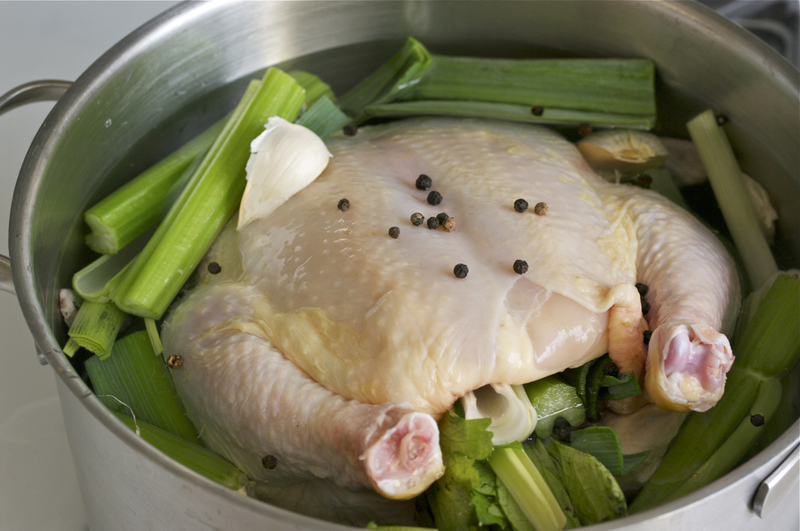 Reduce the heat to low, and simmer for at least 1 hr until the chicken legs are falling off from the body. Take the chicken out, let it rest. 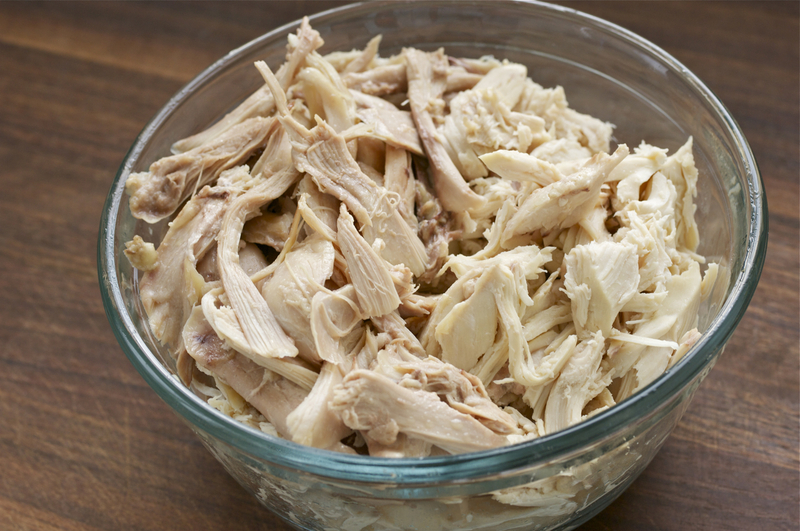 Shred chicken into bite size. 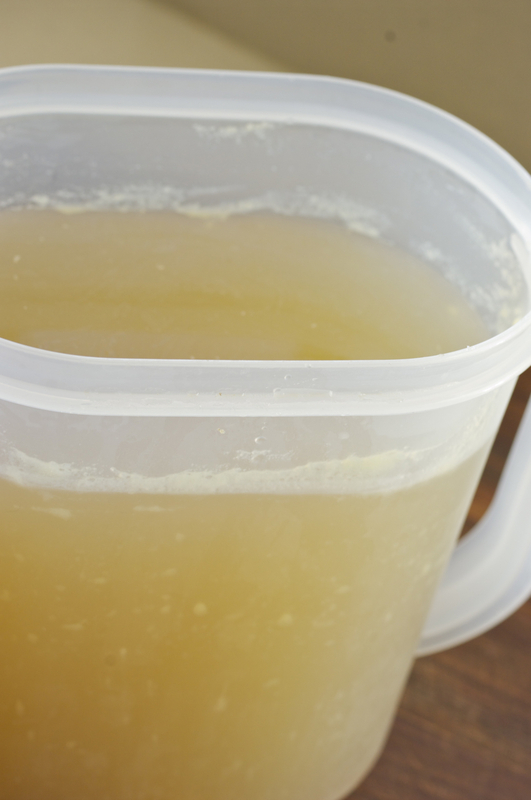 Drain the stock in a mesh to reserve, and discard all the vegetables. 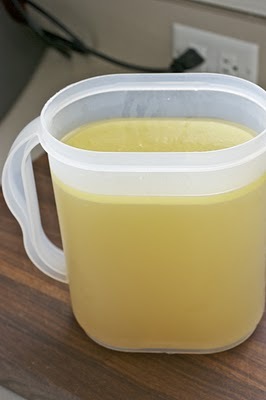 Let the stock to cool down and chill for couple of hours. 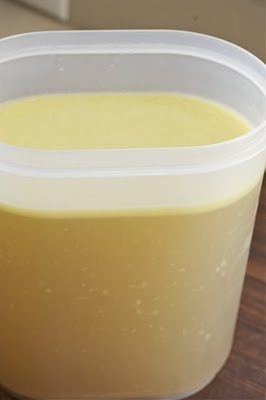 You can easily remove the fat floating on top with a spoon when chilled. To make the soup, saute onion, garlic, and carrot with olive oil in a big pot for 2 minutes over medium high heat. 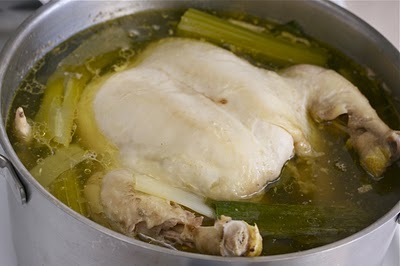 Add the chicken stock, let it boil and reduce he heat to medium-low. 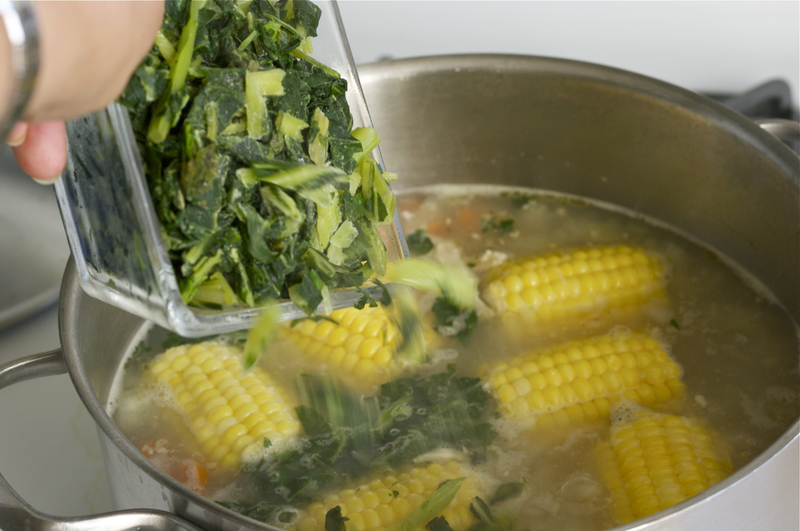 Add corn, chicken and collard green. Let it boil first and reduce the heat to low, cover the lid and simmer for another 10-15 minutes until all the vegetables are tender. Season with some salt and pepper. To serve, place some hot cooked rice (about 1/2 cup or less for each serving) in a serving bowl, pour the hot soup over rice. Top with some tomatoes, cilantro, lime wedge, chili, fresh herbs etc. Serve immediately. What a vibrant and comforting soup! Thanks for sharing! 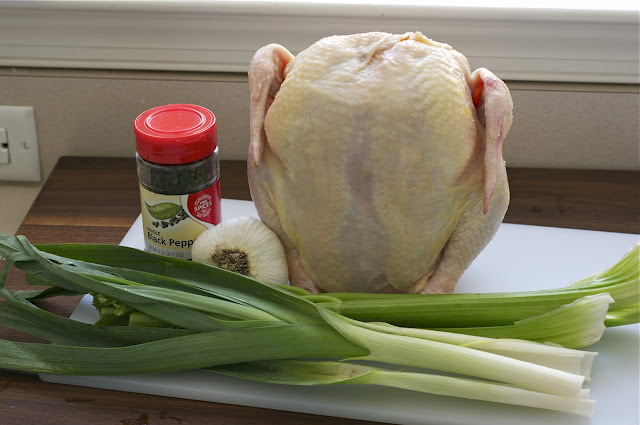 Love the step by step photos hehe headless chicken is funny :P Your soup looks great and definitely heartwarming! I love that you poured the soup over rice. So homey and delicious! This looks warm and comforting. I like the crazy amount of vegetables in it. Usually when I make chicken stock, I add a bit of tomato paste for added color and flavor plus celery, carrots and parsley. Your version is very similar though. Hyegyoung, you are too funny. I can never get through a single post of yours without laughing a little. Keep the great recipes coming! Thanks for the compliment ,Militialicious. This is a yummie recipe but I don't think I'll make it: this is the n. 1 plate that my adorable mother in-law cooks and my husbands loves it. So, I assume my task of loving-enjoying this recipe, but it my mother in-law recipe! And I love her!!! Big kiss for you, my sweet friend! I totally understand what you mean and admire your thoughtfulness toward your mother-in-law. Out of gazillions recipes floating around us these days, it is always good to remember who makes the wonderful certain dishes and cherish their recipes. What a great respect you have! Interesting to find out that mine is similar to your M-i-L's whom I never met. That looks divine. I like how you add collard greens and some other ingredients not in typical American chicken noodle soup. I'm trying to get more veggies in our diets so I'm going to try your version! So this is THE chicken soup I've heard about! My boyfriend is Korean and he always speaks fondly of the foods his oma would make for him - especially when he was ill. This is one of his favorites. We are suffering though long-distance and once when I became sick, it was really hard on him that he couldn't be near me and make me this chicken soup to make me better. Thanks for sharing! I am so glad to hear that. I laughed a little when you mention that you don't let your husband to be near you when you are sick, which I do that too. 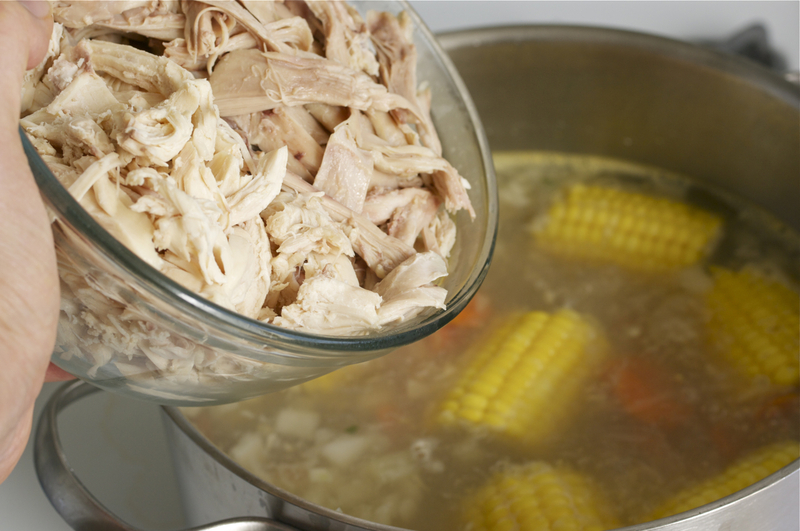 There is nothing like a hot bowl of chicken soup from scratch when you are feeling sick. You have a such a good husband serving you.